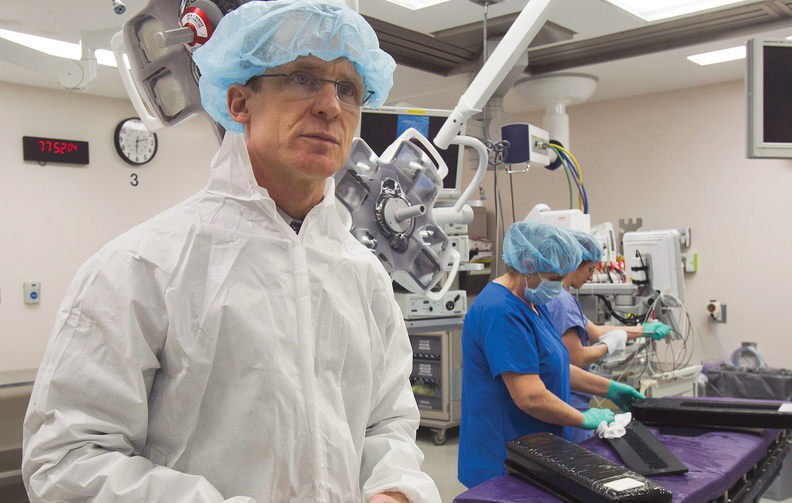 Dr. Kevin Shea, an orthopedic surgeon and an architect of St. Luke's Project Zero program, has helped the staff take aim at surgical-site infections. Access to data was critical for the orthopedic surgeons at St. Luke's Health System in Boise, Idaho, when they launched a project to eliminate hospital-acquired infections in 2011. It enabled them to routinely monitor the system's infection rate after knee and hip replacement surgeries, laminectomy procedures and spinal fusion surgeries. The team used data to reduce foot traffic in operating rooms and change how patients' skin was prepped. Data availability encouraged them to launch their Project Zero campaign. And in the past two years they've reduced the hospital's infection rate from 1.08 per 100 procedures to 0.57 per 100 procedures. Dr. David Pate, CEO of St. Luke's Health, said the Project Zero program was an initiative the orthopedic surgeons began themselves. By allowing physicians to access data easily at any time, the culture shifted to one that motivated staff to develop their own goals. Fostering a culture of transparency on performance measures is one of the key strategies used by St. Luke's and the other health systems that made this year's list of Truven Health Analytics' 15 Top Health Systems. But implementing changes to improve quality in an evolving healthcare reimbursement landscape is a challenge for the health systems, their leaders acknowledged. Truven's best performing systems include the top five from three categories based on operating expenses: large systems generating expenses of more than $1.75 billion; medium-size systems generating between $750 million and $1.75 billion; and small systems with less than $750 million in operating expenses. The 15 were selected from 338 health systems across the U.S. Each was evaluated based on publicly available government data looking at nine performance measures, including death rates, complications, 30-day readmissions and lengths of stay. Complication rates at the top-performing systems were 15.1% lower than their peers. Mortality rates were 14.7% lower among the top-ranked hospitals. Wait times affect patient-experience scores on the Hospital Consumer Assessment of Healthcare Providers and Systems survey, Chenoweth said. Truven includes HCAHPS scores in its analysis. Top-performing systems reported 2.7% better patient-experience scores than their peers, according to the report. For the second year, Truven included Medicare spending per beneficiary in its rankings. The percentage difference between the top health systems and their peers on Medicare spending decreased from 5.2% in last year's analysis to 4.9% this year. This likely reflects an effort by health systems nationwide to address the continuum of care, Chenoweth said. Among the systems recognized by Truven this year, Sutter Health Valley Area in Sacramento, Calif., was recognized for the first time in the large-system category. A subsystem of Sutter Health, which also made the list, Sutter Health Valley Area operates 11 of Sutter's 23 hospitals. To make changes, Sutter initially implements a program at one facility. After monitoring its success, the program is adopted systemwide, said James Conforti, president of Sutter Health Valley Area. Sutter appoints physician leaders and holds staff forums on what changes are coming and why. “We work very closely with our physician leaders and nurse leaders to make sure we're taking a collaborative approach,” Conforti said. Converting all the hospitals in the system to a single electronic health record vendor also helped the system integrate its approach. Data transparency and robust communications help build a culture of constant improvement at the systems that consistently beat their peers on performance measures. The other winners in the large-system category include the Mayo Foundation of Rochester, Minn., and Spectrum Health of Grand Rapids, Mich., for the fifth time each; and Mercy in Chesterfield, Mo., and Sutter Health in Sacramento, both for the first time. Scripps Health in San Diego was on the list for the fourth time in the medium-system category. The system has fostered a culture that encourages staff members to openly discuss goals. The top leaders at the five-hospital health system meet monthly to discuss “literally anything,” said Chris Van Gorder, CEO of Scripps Health. Dubbed the Physician Leadership Cabinet, the meetings include every chief of staff, chief nurse and chief executive from each Scripps hospital. Van Gorder said the meetings have helped the system address protocols during flu season, implement a staff vaccination policy and prepare for the Ebola outbreak in 2014. Other winners in the medium-system category include St. Luke's Health System; Kettering Health Network in Dayton, Ohio, and St. Vincent Health in Indianapolis, for the third time each; as well as TriHealth in Cincinnati for the second time. At MidMichigan Health, based in Midland, a first-time winner in the small-system category, information about the system's performance is released quarterly, said Diane Postler-Slattery, CEO of the four-hospital system. Quality metrics are also available for every department to monitor progress and set goals. The availability of data motivated the emergency department staff at MidMichigan Health Medical Center-Midland to change protocols to improve ED throughput. Using detailed data from its EHR system as a guide, the ED formed three teams. One team focused on the admission process, while others focused on discharge and ancillary testing. As part of their changes, patients are immediately bedded if a room is available, skipping triage. Patients are also automatically assigned to a physician once they are registered so they are quickly given priority. Test results are also given higher priority and delivered to the physician quickly. The changes have reduced ED boarding time for patients at Midland from 9.2 hours a day in March 2015 to 3.7 hours a day in March 2016. Postler-Slattery said that despite improvements, it can be challenging to keep employees motivated. “It's hard … to keep employees engaged when you're always asking them to do things differently in a shorter time frame,” she said. The system has attempted to inspire staff by encouraging communication and a positive outlook. The staff is encouraged to discuss “three good things” they accomplished throughout the day, Postler-Slattery said. Roper St. Francis, a fourth-time Truven winner in the small-systems category based in Charleston, S.C., continues to face challenges as it adapts to a value-based payment model, said Dr. Todd Shuman, chief physician officer at the three-hospital system. For example, Roper St. Francis does not have a skilled-nursing facility. The system has partnered with community facilities to address that care gap, Shuman said. Roper St. Francis also opened its Transitional Care Clinic in 2014 to improve continuum of care. The clinic addresses readmissions in the emergency department among underinsured and uninsured patients. The clinic is staffed with physicians, social workers, dietitians and nurses to help patients manage their health. Since it opened, the clinic has seen more than 1,580 new patients. Of the 272 new patients who visited the clinic in the past year, 13 returned to the emergency room. Shuman said Roper St. Francis has implemented programs such as the Transitional Care Clinic to adapt to a healthcare climate dependent upon transition of care. Other winners in the small-system category include Asante in Medford, Ore., and Tanner Health System in Carrollton, Ga., both for the fourth time; and Lovelace Health System in Albuquerque for the first time.